Johnson is from St.Louis Missouri and was supposed to announce his commitment at the end of July (7/28) but he must have really enjoyed his official visit this weekend. The 6’2” 180 pounder chose the Irish over many schools including: the Michigan Wolverines, LSU Tigers, and Kentucky Wildcats. Johnson is the 6th ranked wide receiver in the country according to the 247 Composite. Jordan is one of the best all-around receivers in the country and has no real weaknesses. He’s very smooth and runs a nice route which makes up for the lack of elite speed (although he is a fairly fast player). Some work in the weight room will help him get off of press coverage a little better — but that’s what Notre Dame hired Matt Balis. 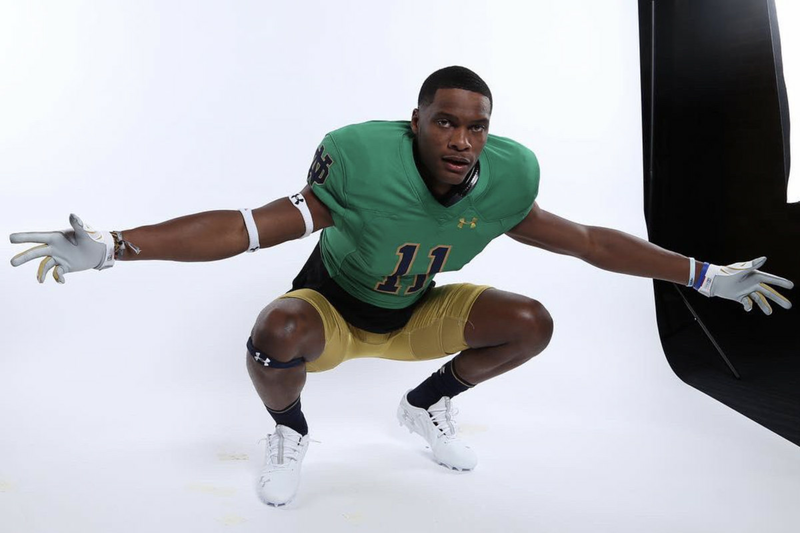 Johnson is the 6th commitment in the 2020 class for the Irish, and are looking at a few more possible commitments this spring as official visit season is underway. We will have more on Johnson’s commitment and what it means on One Foot Down soon.